I was at my desk working, thinking about my new commitments to blogging and what my new topic would be. I realized I had not blogged for a while but every time I did, I was thrilled by the replies. When you – yes, you reading this – take time out of your day to read what I have to share, well, it makes me happy, really truly happy. And it turns out today's blog post is about the word "happy." This blog topic came in a very organic way. Remember I opened with, " I was at my desk..." Stefanie, my co-worker, and one of my best friends walked by (yes, life is good when you get to see a favorite friend week to week. Although, Howard gets annoyed when we talk too much). Stefanie said, "Hey Whit, I have been wearing the 'Do one thing everyday that makes you happy' cuff and you know, Whit, it works. I have been doing one thing every day since wearing it, and I like what is happening from wearing it.'" I was at the market the other day, and I saw a jar of Creamy Coconut Peanut Butter and thought, "Oh yummy! This will make me happy." I thought, “Oh, I do not need it, but ... I think it will make me happy." So I bought it. And guess what? It did make me happy! I do that often when I am at the market. I see jars of delicious gourmet sauces and jams, and, whatever it is, I am tempted to buy what I call "a little jar of happy." 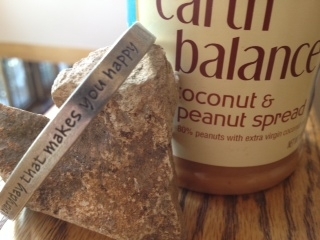 Stefanie’s cuff bracelet "Do one thing everyday that makes you happy," is a great motto by which to live. I walk by my jar of coconut peanut butter (that no one else in my home wants to try), open the lid and dip in my finger. Then I smile really big. I asked Stefanie what some of the things were she has been doing when she looks down at her wrist and is reminded to "Do one thing everyday..."
"I stop and think about my children. They make me happy," she said. I was quite touched by this comment. What is it you do each day to make you happy? What do you do to recognize the need to "do one thing everyday that makes you happy"? Please post and share. You’ll be happy you did! We'll read your comments, and it will make us happy that you shared. Thank you for taking the time to read, listen and post.